Illus. in full color. "In this affectionate story, three children follow their grandfather up to the attic, where he pulls out his old bowler hat, gold-tipped cane, and his tap shoes. 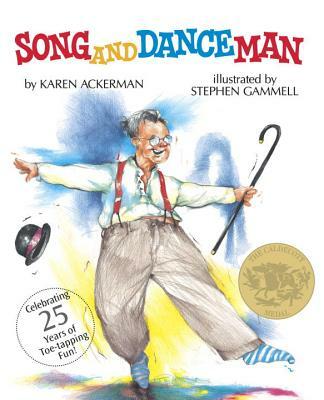 Grandpa once danced on the vaudeville stage, and as he glides across the floor, the children can see what it was like to be a song and dance man. Gammell captures all the story's inherent "joie de vivre" with color pencil renderings that leap off the pages. Bespectacled, enthusiastic Grandpa clearly exudes the message that you're only as old as you feel, but the children respond--as will readers--to the nostalgia of the moment. Utterly original." --(starred) "Booklist. "